Art alumna Alison Lapper MBE tells graduates to be fabulous – just like me! Work hard, follow your passion and “be fabulous – just like me” was the advice given to University of Brighton graduates. 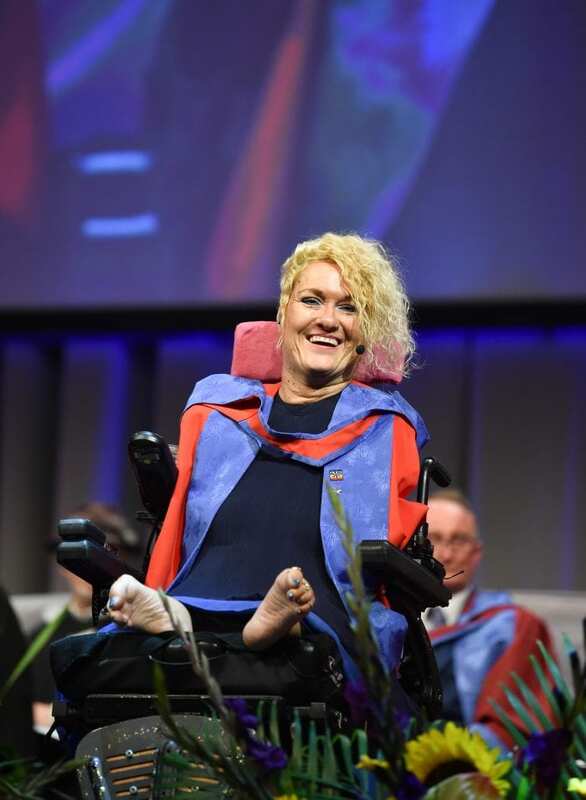 Alison Lapper MBE, artist and author, was keynote speaker today (July 31), the first day of the University’s summer graduation ceremonies at the Brighton Centre. Born without arms and with shortened legs, a condition called phocomelia, Alison is a full member of Foot Painting Artists of the World. She graduated with a first class degree in Fine Art Painting from the University of Brighton in 1993 and in 2014 she was further honoured with a Doctor of Arts from the University in recognition of her major contribution to the arts and as an ambassador for people with disabilities. Alison told graduates: “This is a really special day and I hope you’ll cherish it as much I still do mine all these years later. Alison advised graduates to work hard and said: “If you follow your passion as I have done I hope you will get to where you want to be. “Congratulations to all of you. This is a new beginning for you and I hope you have an amazing career, time, whatever you do with your life. This entry was posted in Alumni, Fine Art and tagged alison lapper, Brighton Centre, graduation.